Table saws are one of the widely popular for almost all kind of wood cutting jobs among workmen around. But when you work alone, you are in real need of something that can support and guide the saw blades. That’s where the role of a table saw push block comes in. Some of us might name the push sticks for table saws, but there are a few drawbacks with them. Firstly, they need to be used as two. Managing them single handedly is a hard job. Also, for people who are new to it, find it hard to keep the balance with sticks. Want to provide maximum safety and perfection on the wooden job with table saws? GRR-RIPPER 3D Pushblock is one popular and tested item to save you DIY jobs with an extra shade of perfection and safety. This is the best pick of our list of push blocks for table saws, and there are reasons behind it. Holding the stock firm for precise cutting is one of the foremost reasons of people looking for support for a table saw. GRR-RIPPER 3D Pushblock here, can play a perfect role I think. Because of it’s three directional force implied on the job, ad the forward controls, you can gain maximum stability to do the cutting job with ease. As the push block is supposed to hold the wood in it’s place, you can’t ignore the gripping power of it. But worry not, the GRR-RIPPER 3D Pushblock has got a firm and non-slip green gripping in it. Materials such as walnut, oak, cherry, pine, ebony, maple, poplar and aluminum can easily be hold still with this block. I have seen to complain about the bouncing backs of work jobs while working with a saw. These are called kickbacks and these lead to extreme imperfection to whatever job you are doing. To overcome this, GRR-RIPPER 3D Pushblock ensure a maximum control and eliminates the kickbacks. The unique design of this table saw push back virtually terminates kickbacks. 3 directional force wit complete control. Can eliminate the kickbacks virtually. Is applicable for a wide range of work materials. Firm and solid green gripper. Complete protection for hands and fingers. Comes with a DVD of advanced cutting techniques. Hard to set and reset the device. We are on the second pick of today’s short list of push blocks for tables saw. Considering the precision d safety, there are numerous products in market. But the bitter truth is, a few of them can provide you both. Whenever you get a precise holding feature in a push block, it lacks the safety. And vice versa. And it’s better than any table saw push stick. But we were fortunate to find the GRR-RIPPER Advanced 3D Pushblock from the manufacturer Grr-Ripper. The GRR-RIPPER Advanced 3D Pushblock is another charming product for providing optimal safety for hands and precision for cutting jobs. And eventually, it’s the updated version of the previously mentioned block. But because of it’s higher price, we’ve given it a second place in the list. The most impressive feature of this product is the improved and better three-directional control of force. With this block on the job, you can control the downward, inward and forward sawing. No matter whichever direction you are cutting through, it will empower you with extreme precision, firm control and optimum safety. 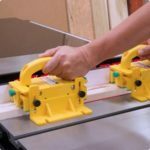 Although the title of this article is to find the best table saw pushing blocks, but I think we’ve got something more. The GRR-RIPPER Advanced 3D Pushblock is comfortable and compatible with table saws, band was, Jointers, Routers and many of the other tools. No matter whatever the cutting tool is, as long as you have a workpiece to hold, use GRR-RIPPER Advanced 3D Pushblock and stay safe. The manufacturer of this GRR-RIPPER Advanced 3D Pushblock knows how much concern you are about safety, while doing such a job. Therefore, it’s engineered to be like a shield for the hands. It will protect from any kind of moving blades, no matter it’s the table saw, the bandsaw or anything else. Provide three legs with green-grip. 100% balance support for any kind of cutting job. Complete three directional control over the cutting job. Protects the job for kickbacks. It’s as precise as a ¼ inches thin rips. Asks for a little more price that the features it offers. Safety and precision is the first and foremost factor while you’re up to a cutting job with a table saw. So do for us. While picking up the best table saw push blocks for this article, we were fully concerned for what it offers in it. And finally, after reviewing them from a neutral perspective we think that both of the blocks worth the money you invest on them. How to Choose the Best Table Saw?